Awesome: Del the Mouse. NEVER! Ohhh? How Can I Ever Learn All This Stuff? Does my Antivirus Program Need an E-mail Scanner? Is Free Really a Business Model? Have you ever been asked to send Plain Text e-mail only and not HTML e-mail? What is this all about? Is HTML e-mail evil? My first exposure to this topic came as a request from a friend who asked me to not send HTML e-mail. Frankly, this left me a bit offended and not quite understanding why HTML e-mail should be a problem. To be honest, I didn’t even know I was sending HTML e-mail. Wasn’t a simple text e-mail without additional formatting and no attachments just Plain Text? No….It was explained to me that that there was an option in the e-mail program that determined whether the e-mail would be sent as Plain Text or in HTML format (e-mail programs are frequently set to send in HTML format by default). In this particular circumstance, my HTML formatted e-mail was being received as an HTML attachment instead of the e-mail text. In order to view my e-mail, it was necessary to open the attachment in another program (in this case Internet Explorer). The recipient had to take additional steps in order to read my e-mail. I changed a setting in my e-mail program to send my friend Plain Text and the issue went away. My e-mails were now being received normally. Not all e-mail programs are fully compatible with one another. Some e-mail programs cannot decipher HTML and either just displays the e-mail as HTML code or worse yet, “hieroglyphics”. Consequently, you may be sending an HTML e-mail to someone’s e-mail program that either cannot read or requires them to take additional steps in order to read it. HTML e-mail can open the door to web bugs. According to Wikipedia, “A web bug is a technique for determining who viewed an HTML-based e-mail message or a web page”. An HTML e-mail message can include a image which must remotely connect to a server in order to be viewed. When your e-mail program downloads the image from their server, information about you can be obtained. This can include IP address, confirmation of e-mail address and verification that the e-mail was opened. HTML Takes Longer to Download than Plain Text e-mail due to larger file size. Users with slower connection speeds, (i.e. dial-up users) appreciate the faster download of plain text e-mails. Problems for Newsgroups (Many newsreader programs cannot interpret HTML and will just display the HTML format code as text) (Note: Users of Newsgroups can set the “News Setting Format” option to Plain Text in a manner similar to setting the “Mail Setting Format” to Plain Text ). 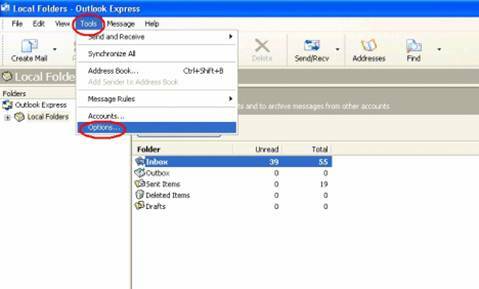 There is more than one way to send e-mail using plain text in Outlook Express. 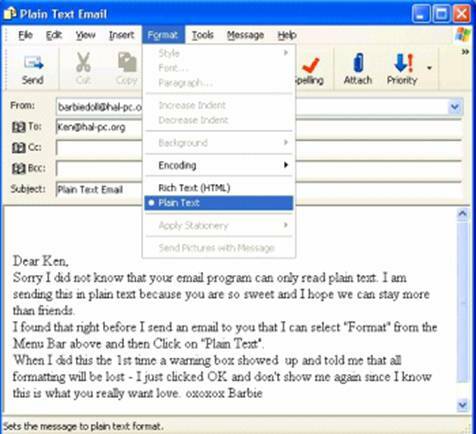 C. Turn on plain text while composing or just prior to sending an e-mail. 4. 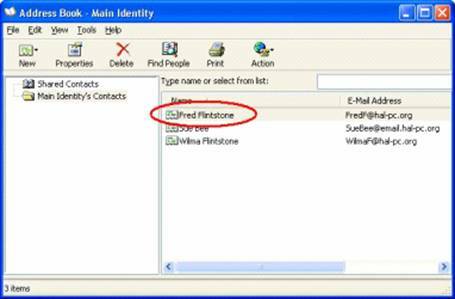 Double-click on the name of the individual you want to only send plain text. 7. 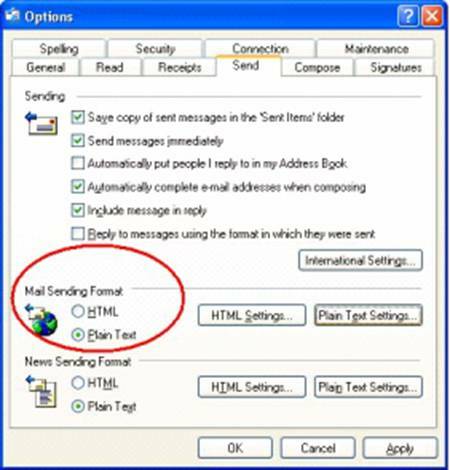 Put a check mark in "Send E-Mail using plain text only"
"Warning: By changing the formatting of this message from HTML to plain text, you will lose any current formatting in the message. 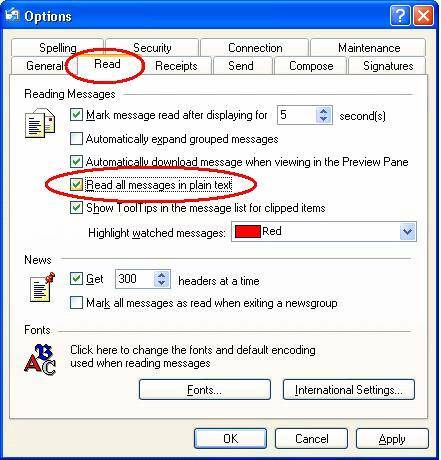 With Outlook Express 6, it is equally easy to set an option to Read all messages in plain text. 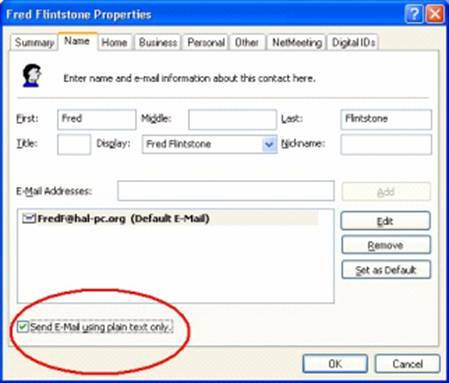 Follow the same steps outlined earlier (see Figure 1) for turning on the plain text for Sending all e-mail messages, but select the Read tab instead. 5. On the Read tab, click to select the “Read all messages in plain text” check box. While you may like the security of viewing your e-mails being in plain text, you occasionally may like to view e-mails from trusted sources in HTML. While reading your plain text e-mail, you can switch to HTML quite simply by clicking on the “View” menu and then selecting “Message in HTML”. 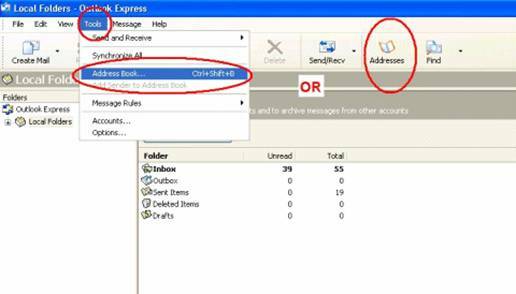 (Note: This enhancement appears to only be available in the XP SP2 version of Outlook Express 6, while all of the other features mentioned earlier are available in the non SP2 versions). The intent of this article is not to prove that there is an evil conspiracy behind HTML e-mail or even to discourage all use of HTML e-mail. In my opinion, provided one practices safe computing (i.e. updated antiviral protection), it is a personal preference if individuals mutually wish to correspond in HTML e-mail using stationery, special formatting, animated gifs, etc. My intent is to explain that there are issues and risks involved in using HTML e-mail. This is why using Plain Text e-mail ONLY is for some like a religion. Instead of being offended when asked to use Plain Text e-mail, please view the request as a matter of Netiquette respecting their preferences and/or necessities. Sue Ostlundt is a HAL-PC member, director, and volunteer. You can e-mail your questions or comments about this article to sue.ostlund@hal-pc.org.